Tamson is manufacturing a CEC L-109-14 bath! Tamson is manufacturing a CEC L-109-14 bath. The CEC L-109-14 test method covers the oxidation test for engine oils operating in the presence of biodiesel fuels. The Tamson CEC L-109-14 bath is a bath with all the accessories to perform tests according to CEC L-109-14. 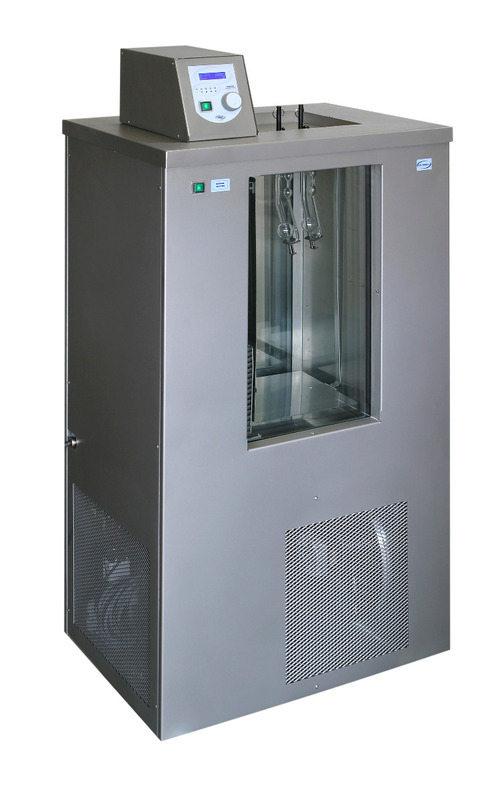 The apparatus consists of a six position TC40 circulator bath and it is standard delivered with six sets of glassware (500 mL flask and condenser). Recently, we delivered the first bath in Indonesia. We will launch a complete test set-up soon. Tamson will be present at PEFTEC in Rotterdam! On May 22 and May 23, the PEFTEC will be held in Rotterdam. Tamson Instruments will be present on booth #73. PEFTEC is the 3rd International Conference & Exhibition on Downstream, Petroleum, Refining and Environmental Technologies. Please let us know at sales@tamson.nl if you will attend the show! Tamson is proud to have built two more TV7000LT baths. Those precision instruments will be used in metrological institutes in China and in Uzbekistan. Both baths will be used for calibration purposes at sub-zero temperatures.On the picture below, the baths have just been tested. The history of the TV7000LT goes back many years. In the early seventies a similar system was made by Tamson with a built-in cooling system. 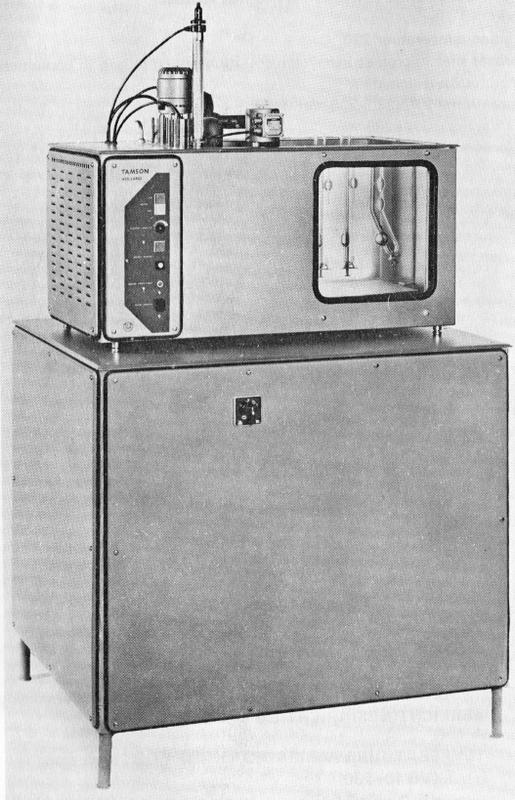 The temperature control was based on a mercury contact thermometer and the refrigeration on an off-shelf conventional cooling system. This design resulted in this big apparatus. In this apparatus, you will see a high temperature viscosity bath standing on the cooling unit. Back in the seventies, temperature control was still done by using the mercury contact thermometers, instead of the PT100s that became in use later. The minimum temperature was restricted to -20 degrees Centigrade and the immersion depth dept was limited to 300mm. In 2005 a new system was developed upon request for the French national laboratory in Paris. This unit was based on a TV7000 system and with 600mm it doubled the original immersion depth. This new bath was called the TV7000LT TV stands for Tamson Visibility bath, 7000 to indicate a volume of 70 Liters, and LT stands for Low Temperature. This bath more looks like the bath we produce nowadays. The cooling system was redesigned to reduce the energy consumption significantly. The cooling system is based on a two mode principle, where the cooling down of the bath goes fast, and once the bath reaches the setpoint temperature, it switches to a mode where less power is used. It also enables the use of the bath over a much wider temperature range, ranging from -40 up to +100 degrees Centigrade. However, when using the TV7000LT at a wide range, you have to consider the bath fluid that you are using. For temperatures down to minus 20 water glycol mixtures are popular. For lower temperatures ethanol (or methanol) can be used. When working close to 100 degrees Celsius, silicon oil has to be used, because water does evaporate. The TV7000LT offers excellent temperature stability. This makes it a good solution for all kind of calibration purposes, such as the calibration of viscometers conform ASTM D2162. Please see our winter newsletter below. In this newsletter, two new products are announced, the Tamson Freezing Point Tester and the Total Sediment Tester. Both products can be found on the website and in our price list. The entire Tamson team wishes you a Merry Christmas and a Happy New Year! This year, Tamson celebrates its 140th Birthday. Tamson is founded on 1 April 1878 by Mrs. Tamson in dedication to her husband, Paulus Marinus Tamson. Tamson started as a wholesaler. The company was trading in laboratory equipment in the field of chemistry and physics. By the 1950s, Tamson started the production of thermostatic baths and circulators. During the 190s, Tamson was famous for its catalog, populary called the 'yellow bible', because it was a very thick yellow catalog, full with all kinds of laboratory equipment. During the 1980s, Tamson also launched the TV2000, TV4000 and TV7000 for the first time, which are the predecessors of the modern day TV2000, TV4000 and TV7000. The famous PMT logo is still being used today. The Tamson team is proud to work for a company which such a rich history that exists for 140 years this year. Tamson Instruments is proud to announce that we finished production of a special a few weeks ago: Our T17000 bath, a bath that has a volume of 170 liters and can achieve a stability better than 0.01 degrees Celsius! 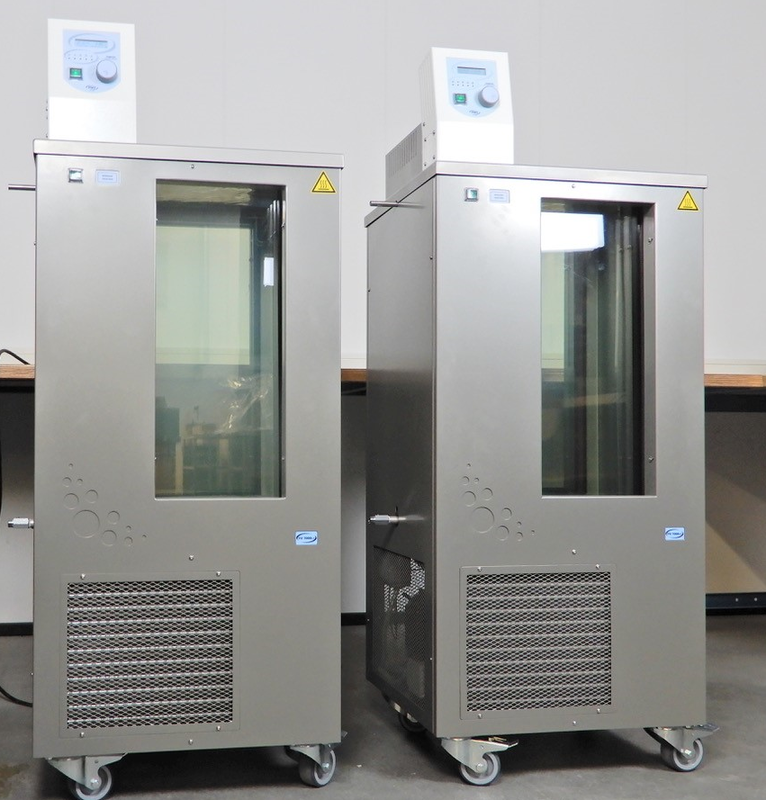 The T17000 is for VSL Dutch Metrology Institute , where it will be used as diffusion bath for making dynamic gas mixtures with volatile organic components. ACHEMA 2018 was a success!